Aside from trying to eat healthy to feel good, all-natural skincare products are also a good way to keep ourselves healthy on the outside. Human Heart Nature is one company that provides these kinds of products and as a fan of theirs, I have been trying out a lot of their products. 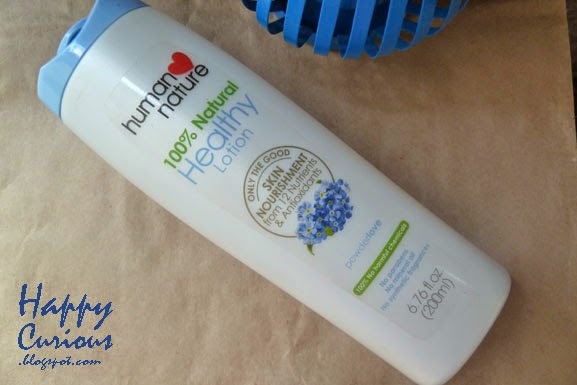 A lotion that has become my favorite recently is their 100% Natural Healthy Lotion, not just for the health benefits but also for the addicting smell without the addicting chemicals, of course. Their lotions have always been a staple in my personal care shopping list since they have no parabens, no mineral oil and no synthetic fragrance. It even says "100% no harmful chemicals" on the bottle itself. This has 3 scent variants: Berry Bliss in a bottle with a deep red cap, Blossom Beauty in a bottle with a pink cap and Powder Love in powder blue cap. The first one smells of berries and the second one of flowers. But although red and pink is a favorite color of mine, I have always been a fan of the baby powder smell, so I opted for the blue one. Rich in 12 powerful nutrients and antioxidants. Infused with all-natural moisture boosters aloe vera, coconut, sunlower & avocado oils. Non-whitening & non-tanning for 100% true and healthy Filipina beauty. 3 refreshing scents: Blossom Beauty, Berry Bliss & Powder Love. So what do I love about this lotion? Aside from the heavenly smell, I also like that it does not feel greasy like most commercial lotions. It does take a while to absorb but once it's in your skin, you smell great all day and you can enjoy moisturized skin all day too. Since it's a little bit runny, you may make the mistake of putting on too much. But with this one, a little goes a long way, so start with a small dollop and add little by little as needed. Every time you apply this, take the time to experience the pleasant feeling of a self-massage. Some people may not like the non-whitening and non-tanning bit but if you don't mind staying with your natural skin color, then this is definitely worth the investment. I've been slathering this on from summer to the "ber" months and it has never failed me. I like that it is non-greasy because it keeps me cool and comfortable during the hot months. On cold months, it keeps me moisturized all day too so I don't have to worry about flaky skin on my arms and legs. And so far, my skin has had no complaints. Ive only been feeling moisturized all over and my skin has been clearing up on patchy, dry areas. The 200ml bottles costs Php199.75 while the smaller 50ml bottle costs Php64.75. I keep the 200ml bottle at home and take the smaller one for my travels. Plus, if you run out of face moisturizer, you can slather this on instead. So it's a multi-tasking beauty product too! What's not to love?